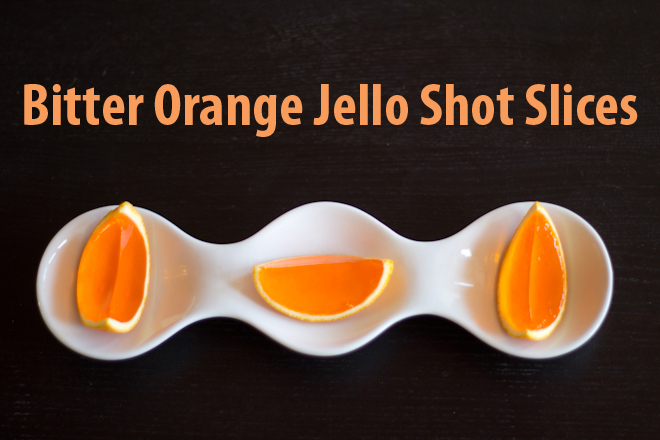 Ending my Lunar New Year Party with Bitter Orange Jello Shots was a hit, so I will pass along this simple recipe. 1. Slice oranges in half across the navel. Cut a slit in the pith near the navel, where it is strongest. 2. Slide the end of a metal spoon between skin and fruit to remove cleanly and reserve fruit for another use. 3. Bring water to a boil, and remove from heat. 4. Stir Jello into hot water until dissolved, then stir in cold water , vodka and bitters. 5. Set orange peel halves into shallow cups on a tray so that the edges are level and fill with jello liquid to the rim. 6. Let cool overnight in the refrigerator and slice each half into thirds with two vertical cuts.